(Nanowerk News) Researchers at Fraunhofer IPA have developed a new process that combines 3D printing and casting. In additive freeform casting (AFFC), first a shell of the part is manufactured using FLM printing, then this shell is filled with a two-component resin. This saves time, increases stability of the part and allows new materials to be printed. Additive manufacturing, also known as 3D printing, already presents a wide range of advantages for industry. IPA expert Jonas Fischer explains: "You enter the CAD data for a workpiece and receive a finished part." Small batches, prototypes and individual pieces are all faster and more cost effective to manufacture than is the case with injection molding. Moreover, complex structures and integrated functionalities can be created. However, there are still some weak points. With FLM (fused layer modelling) printing, the most widespread method, a nozzle deposits the printed material in parallel lines. This creates seams and porosities. Jonas Fischer adds: "The material is not completely in the form like it is when molded. This means that the component has worse mechanical properties." Furthermore, during FLM processes the nozzle applies each layer individually. It takes a long time for a large component to be constructed. A third disadvantage is that only plastics that become soft when heated (called thermoplastics) can be used with FDM printing. Thermosets, which remain stable after hardening regardless of any heat administered, cannot be printed. With additive freeform molding, researchers at Fraunhofer have now found a way to keep these downsides to a minimum. To do this, they combined the additive process with a molding procedure. The first step is to manufacture the shell of the part via the FLM process. The experts use polyvinyl acetate (PVA), a water-soluble synthetic polymer, as the printing material. Subsequently, the shells are filled automatically with a precisely dosed quantity of polyurethane or epoxy resin. With polyurethane, it only takes three minutes for the filling to be cured. Next, the number of components can be increased if desired. As soon as the process is complete and the part has hardened, the shape is removed and placed in a water bath. 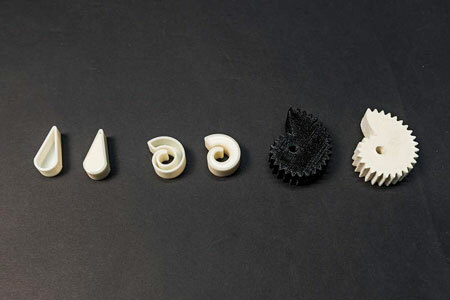 This creates a 3D-printed workpiece with the properties similar to those of an cast part. In order to inject the filling material into the mold, IPA researchers installed a special dosing unit for two-component materials in the 3D printer. This means it is possible to perform the entire process – printing the shell and the filling – in one piece. The printing process does not have to be interrupted and can be controlled fully digitally as with conventional 3D printing. Also, the procedure enables two-component resins to be used. Heat-resistant thermosets can be used as a construction material. Moreover, it is claimed that components can be manufactured much more quickly. Jonas Fischer adds: "You only need to print the shell – gravity does the rest of the work." Last but not least, the components are reported to be significantly more stable as the material completely fills the form, so no porosities or air pockets occur. The new method is suited for a variety of application areas and industries. Fischer explains: "For instance, it can be used for electrical isolation components like sockets. Foams and cushions, such as those needed for safety elements, are also suited to this procedure." In principle, the combined freeform casting is said to always be the preferred option when large, complex components are required in small quantities. Moreover, it can help to reduce weight. IPA researchers have successfully proven the feasibility of this process in a pre-research project. Furthermore, they created various components as prototypes. Now the researchers are looking for industry partners to support them in further developing the process for series production. They are also seeking materials manufacturers to improve the properties of the two-component mixture together with researchers. Companies with ideas for various application areas of thermosets are welcome too.